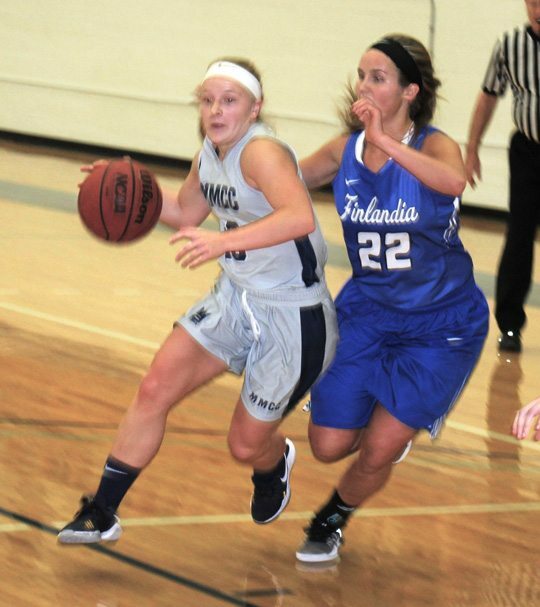 Finlandia University first-year women’s basketball coach John “Mo” Motherwell knows there is high school talent in the Copper Country. If he had any doubts, last Friday night’s Mid Michigan Community College and Finlandia meeting was good proof. The top four scorers in the contest, Kelsie Richards, Julia Daavettila, Clara Loukus and Maija Sebbas all hail from local schools. Unfortunately for the Lions, two of those players, Loukus and Sebbas, played for MMCC. The two local products literally had their own rooting sections at Paavo Nurmi Gymnasium and were greeted with loud cheers whenever they did something positive in the game. MMCC knows all about the talent locally. The Lakers recruited Calumet’s Ellen Twardzik three years ago, added Loukus of Calumet two years ago and signed Sebbas of Hancock this past year. MMCC posted a 25-4 record and made it to the National Junior College Tournament last season. Finlandia has also done well with local players in the past. They won an NJCA title in 2004, led by players like Beth Koski of Baraga and Brooke Sirard of L’Anse. This year’s team boasts players from Houghton (Richards), Dollar Bay (Daavettila), Hancock (Molly Berg and Taylor Pertile) and Jeffers (Haley Makela and Julia Nordstrom). What the Lions have sorely lacked for a long time is a tall pivot player like the 6-foot-2 Sirard, who averaged double figures in points, rebounds and blocked shots one season while in high school. Other local hoopsters are doing well. Carsen Osterman (Baraga) is at UW-Stout, Lori Wardzyski (Ontonagon) and Bailey Froberg (L’Anse) play at Gogebic and Justice Kinnunen (Baraga) is at Bay College. And let’s not forget that Houghton standouts Elisha Jurmu and Sloane Zenner are on the roster at highly-ranked Michigan Tech. Since MMCC, Gogebic CC and Bay College are two-year colleges, those players could decide to transfer, perhaps to Finlandia. “We would certainly welcome them,” Motherwell said.